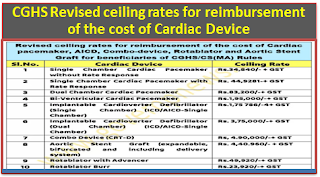 Subject:- Revision of ceiling rates for reimbursement of the cost of Cardiac pacemaker, AlCD, Combo-device, Rotablator and Aortic Stent Graft for beneficiaries of CGHS/CS(MA) Rules. 2. Other terms and conditions prescribed under OM No 12034/02/2014/Misc./-CGHS D.III dated 22nd July 2014 shall remain unchanged. 3. These rates shall remain valid till the rates for the above devices are notified by National Pharmaceutical Pricing Authority (NPPA). 4. Issued with the concurrence of SS&FA, Ministry of Health & Family Welfare vide CD - No.1295 dated 25.07.2018. 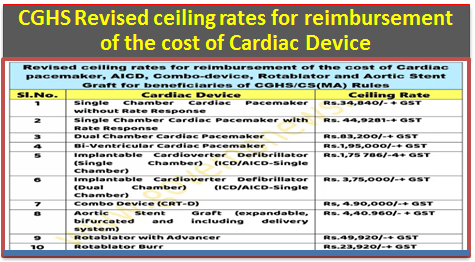 Revision of ceiling rates for reimbursement of the cost of Cardiac pacemaker, AlCD, Combo-device, Rotablator and Aortic Stent Graft for beneficiaries of CGHS/CS(MA) Rules.